The main theme is ‘From bovine to handbag, from ox to leather pants, from cow to elegant shoe’. This year Amnesty International offers the best cartoon with the theme ‘People and ideas behind bars’ a special prize. • Contributions have to be digital works. They shouldn’t contain an explanation of the drawing. • The digital works have to be sent in JPEG format with a minimum of resolution of 300 dpi (2480 x 3543 pixels). • You can sign up your participation from 1 July 2019.
within 2 days after the request of the organization. Prize-winning works will become the property of the organizer or theme sponsor. All works selected may be used by the organizers to promote the contest and the village of Olen. The jury consists of artists, cartoonists and laymen. Decisions made by the jury cannot be challenged. The deadline is 21 September 2019 at 12.00 AM midnight. The entry form you can find on www.olensekartoenale.be where you also can upload your works. 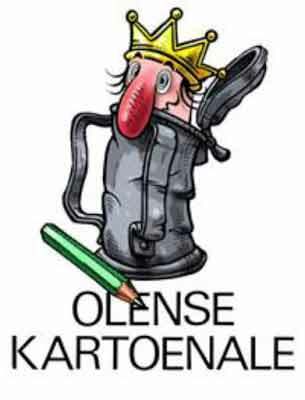 Do not sent your works to kartoenale@olen.be. The prize ceremony will take place at Friday 15 November 2019 at approximately 20.00 h in the council room of the town hall of Olen, Dorp 1, 2250 Olen. Every participating artist will be welcome on that occasion. Only the winners are personally invited. 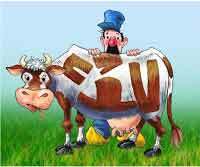 The Belgian company Sopraco is an important distributor of veal and beef in Europe. This company delivers meat for wholesale, retail, butcheries and catering industry. Recently Sopraco has been specialising in upgrading the skins of cows and bovines to manufacture leather. Bovines used to produce veal predominantly are male animals from dairy farms. Next to nothing gets lost in this process of meat production. Even the animal’s skin is being transformed to a fine product: leather. Explicit images are not welcome. Sitting behind bars, what does that mean to you? 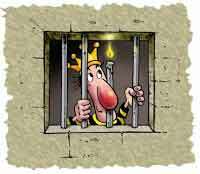 How difficult is it being alone in a cell or with others? Your thoughts and dreams are they shakled as well? Is time a gift, an opportunity for reflection or rather a curse? Are there despite the confinement still positive aspects to this experience? Is art an option, a voice, a release?